There are three main phases of the malting process. This is where we let the grains steep in water in order to bring the moisture content up in the grains. This starts the process of germination, which is when the roots actually start to emerge from the seed. This typically takes around 2 days. This is when we actually let the grains start to grow under a controlled environment. 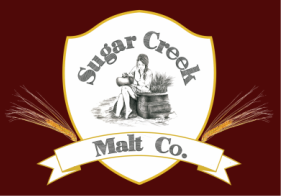 At Sugar Creek Malt Co. we germinate on the floor. We spread the grain out over a large area and let the grains germinate naturally. We rake the grains every few hours to allow oxygen to get to the grains and to prevent the grain from getting too hot. The reason we germinate is to allow the production of the enzymes that naturally break down the kernels starches into sugars. These sugars are then what brewers extract from the grain when mashing to make delicious tasty beer! This takes anywhere from 3-5 days. The last step is drying and kilning the grains. This is done after the grains have fully modified. We put the grains in a big kiln and dry them out to keep them from growing too much. Then after they have dried we heat them up and allow them to develop the color and flavor we all love! Different temperatures and different times create the long list of malts we all know! There are many small steps before, after, and in between these three main steps. Cleaning, roasting, packaging, moving, cleaning again, and lab analysis are just a few. It keeps us maltsters busy!